Volunteers for Christ exists to proclaim and demonstrate the Gospel, that is, the good news of Jesus Christ to the students of the University of Tennessee, Knoxville. 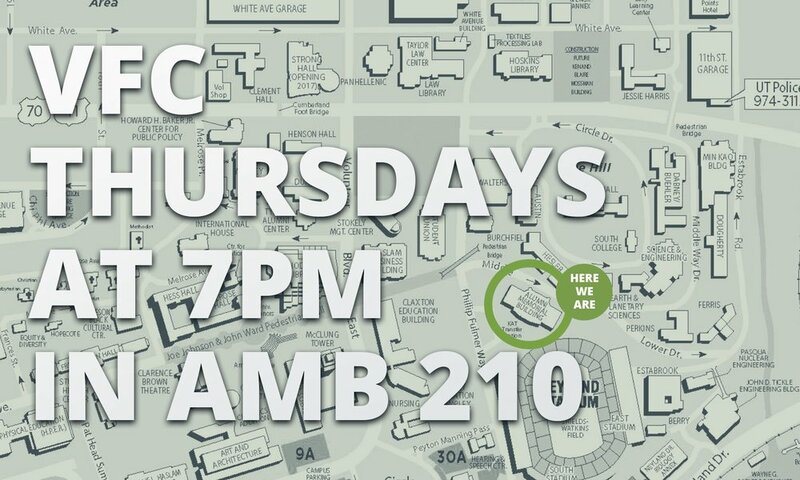 We have a campus-wide meeting each Thursday night on campus in AMB 210 at 7pm. We also meet each Tuesday night in the different residence halls across campus! To stay up to date on events, meetings, and what God is doing in our midst, make sure to visit our “Contact” tab, fill out the survey, follow us on instagram, and download our app! VFC is a nonprofit, completely funded through partnerships in the Gospel. All support that VFC receives goes directly to our operating budget - covering the cost of conferences, events, supplies, training material, promotion, advertising, Bibles, and intern salaries. Please consider partnering with VFC to make us more effective on campus and to enable us to accomplish our mission: glorifying God through the proclamation and demonstration of the Gospel of Jesus Christ. All of our outreach, evangelism, discipleship, and deployment of student leaders is only possible because of the generous support from people like you. So thank you! Support a VFC and/or an Intern by donating through our online giving system. To set up recurring gifts with a credit card or bank draft, log into our Online System (CCB), or contact the church office for help at 865-694-4356.